The R scripts used for both of these, as well as what’s covered in this post, are posted on Github and available for download and re-use (open source FTW!). Let’s Mash Parts 1 and 2 Together! Which of the metrics changed significantly over the past week within specific combinations of two different dimensions? This, clearly, is not a business stakeholder-facing visualization. And, it’s not a color-blind friendly visualization (although the script can easily be updated to use a non-red/green palette). Hopefully, even without reading the detailed description, the visualization above jumps out as saying, “Wow. Something pretty good looks to have happened for Segment E overall last week, and, specifically, Segment E traffic arriving from Channel #4.” That would be an accurate interpretation. This example had three “good anomalies” (the three dots that are outside — and above — the prediction interval) in the last week. 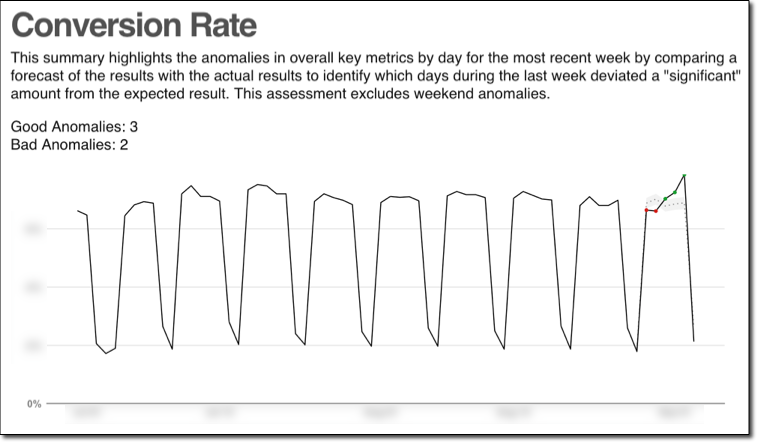 And, it had two “bad anomalies” (the two dots at the beginning of the week that are outside — and below — the prediction interval). 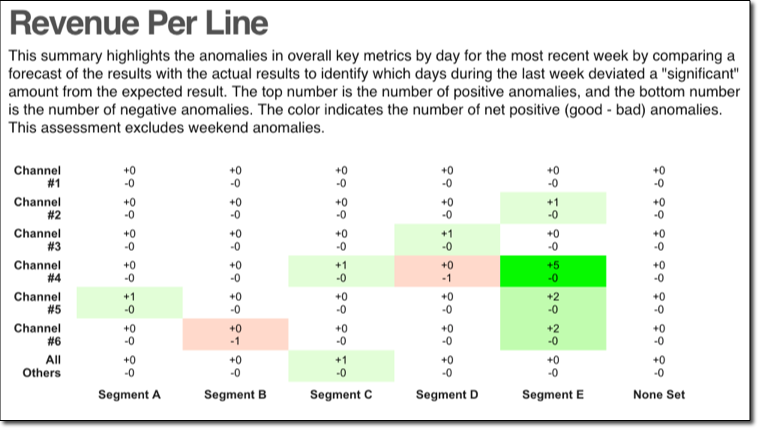 If the script is set to look at the previous week, and if weekends are ignored (which is a configuration within the script), then that means the total possible range for net positive anomalies is -5 to +5. That’s a nice range to provide a spectrum for a heatmap! You can think of each cell as having a trendline with a forecast and prediction confidence band for the last period, but actually displaying all of those charts would be a lot of charts! With the heatmap shown above, there are 42 different slices represented for each metric (there is then one slide for each metric), and it’s quick to interpret the results once you know what they’re showing. Almost equally importantly, the building blocks I’ve put in place, I think, provide a foundation that I (or anyone) can springboard off of to extend the capabilities in a number of different directions. I have also faced the same question of the blogpost title. If it is about conversion rate or any other quantity that is essentially a ratio of some sort, one way is to use hypothesis testing for proportions, as in #convertions / #sessions this Monday vs the corresponding sums for the last say 4 or 8 Mondays, assuming that the seasonality mostly depends on the day of week. I find the suggested method here probably more comprehensive as it can also account for other types of seasonality and being able to visualise it is also nice. Thanks for sharing it. I’ve actually built some pretty monstrous spreadsheets that take that approach — looking at the “same day of week” for the past X weeks, checking the average and standard deviation for those days, and then looking to see if the current value falls far enough from the mean to be noteworthy. That has some logic, and it was certainly better than nothing, but things definitely started to get pretty ugly formula-wise in Excel. And, we kept trying to add more and more rules to look for anomalies, and it started to look like a process that was going to collapse under its own weight.